As you know, the Colón is now closed and will theoretically stay thus until May 2008 , when it will be reopened with Verdi’s “Aida”, commemorating the hundredth anniversary of the theatre with the opera performed at its inauguration. Those eighteen months will see the restoration of the main hall and the stage (among other areas) according to the highly controversial Master Plan. Seven crucial bids for specific items still haven’t been announced, which makes it highly doubtful that the chronology will be respected. Specific action has been implemented at the City Legislature, which has sent a questionnaire to the Executive and has formed a Committee for the monitoring of the Master Plan. Time will tell its own story. But that uncertain future before us was preceded by a triumphant goodbye to the Colón, a series of performances of Mussorgsky’s “Boris Godunov” that meant a powerful contribution to our operatic life . 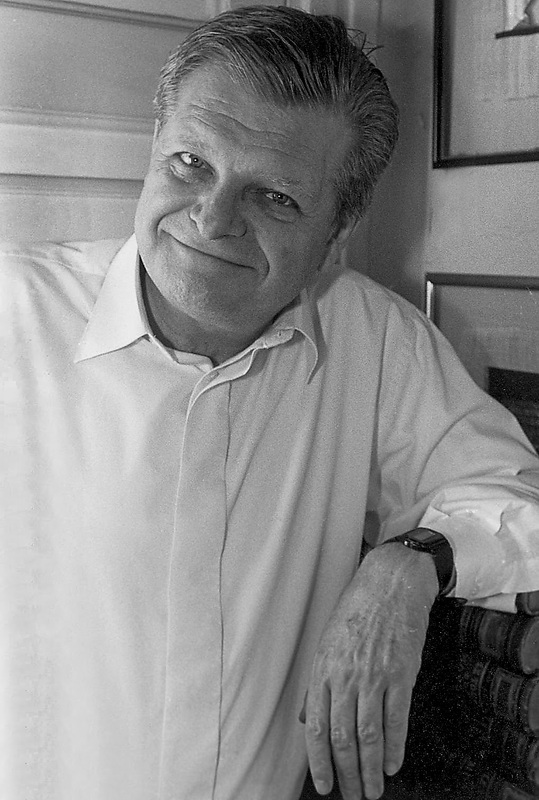 Marcelo Lombardero, the current Artistic Director, has given us, in South-American premiere, the original full version of Mussorgsky ; not the first, 1869 version which our city saw back in 1998 when we had the unforgettable visit of the full Maryinsky Theatre from Saint Petersburg, but the 1874 revision that added two fundamental things to the original seven scenes: the so-called Polish Act and the closing Revolutionary Scene. I’m not recommending that the Rimsky-Korsakov revision that made the work famous all over the world should be scrapped: I think it’s admirable and that the best solution will be from now on to alternate in successive revivals between the 1874 Mussorgsky and the Rimsky. What are the main differences between pure Mussorgsky (M) and Mussorgsky/Rimsky? (M/R) Well, M is certainly starker and barer, with disquieting harmonies (which informed opinion no longer considers “errors”), a deeper sense of essential Russianness, pronounced verbal Expressionism, an undernourished and gray orchestration. Precisely this last element is the great distinction of M/R, for Rimsky was the undeniable master of color and wrote a treaty on the subject; when you hear his treatment of the Coronation Scene, all the splendor of the Czars is there; with M the feeling is ominous, you hear the downfall rather than the assumption. So the total effect of M is certainly less accessible but profound in the way a Tarkovsky film is. The Colón undertook the task with the seriousness of a first-class opera house. The musical side was of a high level, without being outstanding. The staging, alas, fell into the trendy and silly trap of changing the historical context: Mario Pontiggia, after doing the Prologue and First Act in its proper 1600s ambience, absurdly decided to transport Boris and everybody else to the middle 1800s, ditto in the Polish Act. And then he reversed and the final act went back to the 1600s! However, in other aspects Pontiggia did well: he moved the big choral scenes with good timing, the psychological relationships weren’t distorted, and the drama was communicated. One thing was horrid and shouldn’t have been allowed: the ceremonial Polonaise was done by just three dancers in modern tights to a choreography by Carlos Trunsky that went completely awry in style. The aesthetics of Diego Siliano’s stage designs were agreeable though hardly Russian; a silhouette of a cathedral was as far as he went. But (more to cut costs than for artistic reasons) we saw a unit set of a variegated wall used in different combinations and parts to represent such disparate things as a tavern, a monk’s cell, a Polish palace, etc. Of course costume designer Daniela Taiana had to comply to Pontiggia’s excentric translation of the action to the 1800s; her costumes were mostly adequate though some didn’t look rich enough. Good lighting by Rubén Conde. The conducting by Stefan Lano was clear, with rather slow and morose tempi, certainly logical but lacking expansion and emotional communication; the Orchestra played quite well. Excellent work from the Colón Chorus (Salvatore Caputo) and the Children’s Chorus (Valdo Sciammarella). There was a solid double cast: Anatoly Kotcherga (debut) did Boris with a fine bass voice used with authority and a massive presence; and Mijail Kit gave us a leaner, older Boris , done with fine professionalism. Except from some tense high notes, both Kit and Feódor Kuznetsov sang admirably as the monk Pimen. I was agreeably surprised by the aplomb and intensity of Enrique Folger as the false Dimitri who will usurp the throne; Fernando Chalabe was correct, no more. We had fine Marinas (the Polish Princess): Cecilia Díaz and Virginia Correa Dupuy. Luis Gaeta was splendidly truculent as the mendicant monk Varlaam; Hernán Iturralde sang well but was less of a character. Ariel Cazes was more convincing as the devious Jesuit Rangoni than the exaggerated Lucas Debevec Mayer. Carlos Bengolea and Gabriel Renaud dealt well with the slimy ambiguity of their Boyar Shuisky. Good jobs from (among others) Ana Laura Menéndez and María José Dulín, Elisabeth Canis and Alicia Cecotti, Omar Carrión and Leonardo Estévez, Renaud and Eduardo Ayas (as Misail), Graciela Alperyn and Marcela Pichot. Osvaldo Peroni and Gabriel Centeno sang well as the Innocent but didn’t catch his peculiar anguish. As the Innocent sang his final lament, I thought of the pain of the Russian people though the centuries and I wished them well for the future. 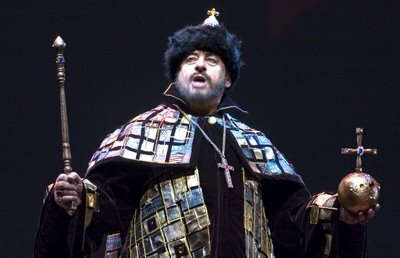 Boris Godunov is realy one of the best Russian operas. I hope in the Colón the performance was so good as in the Maryinsky theatre.